Danielle Fici was radiant and glowing from the inside out as she made her way down the aisle to marry her love, Sani Fici, on November 19, 2016 at Marina Del Rey in New York. Feeling beautiful from head to toe in her wedding ensemble, Danielle's dreams of being a bridal beauty had finally come true. 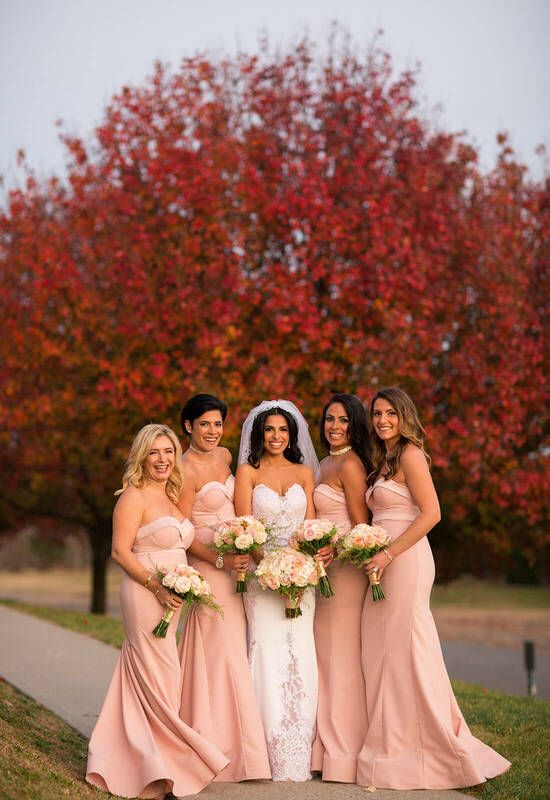 For Danielle, her trip to the Pnina Tornai Boutique at Kleinfeld Bridal was everything she could have hoped for and more. With an idea of a fitted, lace mermaid gown in mind, Danielle began trying on gowns at the salon. However, it didn't take her long before she found exactly what she was looking for. Trying on only her second gown, Danielle knew immediately that this was the gown for her. Danielle fell in love with a fitted lace gown with an illusion corset and softly flared cathedral length train. To top off having found the perfect gown, Danielle got to have her measurements taken by Pnina Tornai herself after she said yes to the dress. However, the gown wasn't the only thing that Danielle was going to say yes to that day. Danielle had a full bridal look in mind and she wasn't leaving the boutique until her vision was complete. To start, Danielle worked with Pnina to customize her corset, softening the illusion component with more fabric so that while her skin color peaked through the stunningly intricate lace, she still felt covered up enough for her family. Next, Danielle completed her wedding day ensemble with the perfect accessories. Since her gown was Pnina Tornai, Danielle figured that the best pieces to compliment her gown would be made by the same designer. 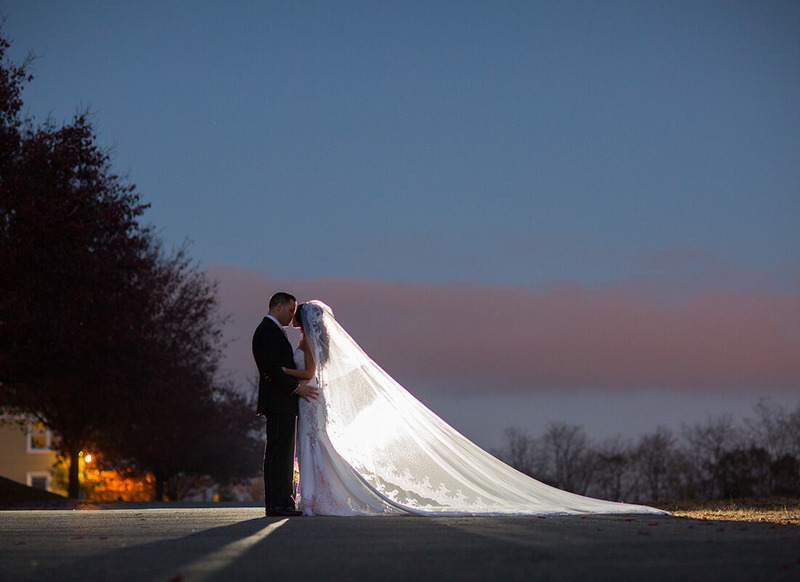 Loving the cathedral length train on her gown, Danielle sought to mimic that with her mantilla veil, which evoked the Spanish flair that she desired. 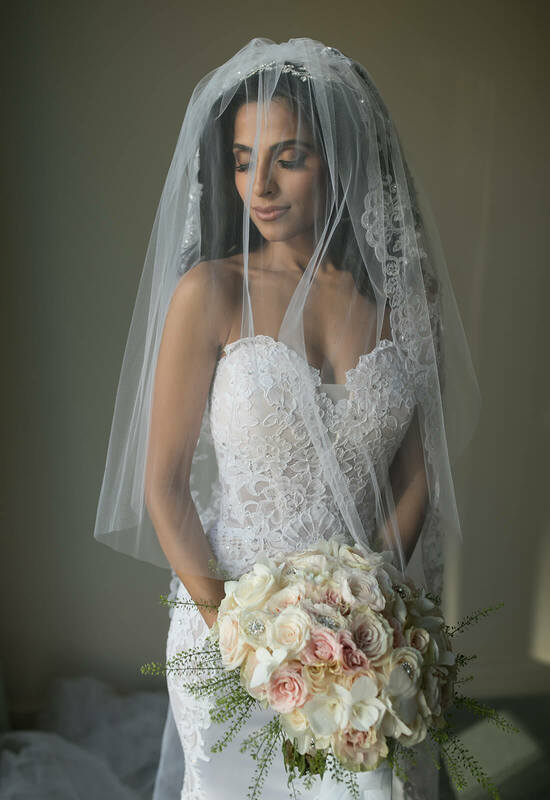 It matched the lace on the gown perfectly, allowing Danielle and her guests to not only see the detailing of the lace on her gown, but also the detailing of the lace on her veil. It was an ideal pairing and the two pieces worked wonderfully together. For Danielle it was a no-brainer that she would wear her hair down on her wedding day. Her husband loved it down and it just felt like her to wear her hair that way. Therefore, for the parts of the day when Danielle was not wearing her gorgeous veil, Danielle purchased a Pnina Tornai headband to wear on top of her luscious curls. The floral details of the headpiece mirrored the floral qualities in the lace of her gown and Danielle thought that the piece had a “viney sexiness” to it that complimented her look very well. Last, but certainly not least, came the shoes. To tie her whole bridal ensemble together, Danielle opted for a pair of Pnina Tornai heels that had the same vine detailing on them as her headband. Both comfortable and beautiful, the heels proved to be a superb finishing touch to her wedding day look. With all of the pieces falling into place, Danielle was ready to walk down the aisle to wed her soulmate. Walking down the aisle, a captivating smile covering her face, Danielle could not have been a happier bride. Looking timeless and just the right amount of bridal for her liking, Danielle felt like the luckiest bride in the world that day. Marrying her soulmate and looking flawless from her eye-catching veil and headpiece, to her sultry gown and matching heels, it's easy to believe that she was truly lucky indeed!